Can you say Black Friday on Wednesday? Cardstore.com is in on the act. Here is their hot deal BLACK FRIDAY EVENT! 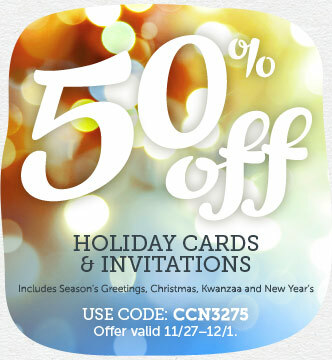 50% off all Holiday Cards & Invites + Free Shipping on Orders $30+ at Cardstore! Includes Season's Greetings, Christmas, Kwanzaa, & New Year's. Use code: CCN3275, Valid 11/27 through 12/1/13. Shop Now!